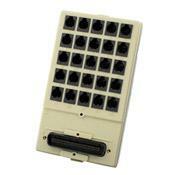 Quickly and easily identify ports on your patch panel or patch block for a perfectly organized installation. Universal / 110-style labeling kits are used with 12- 24- 48 and 96-port panels. Templates for use with RhinoPRO label printers are available at rhinoprolabeling.com.